MILWAUKEE - Feb. 19, 2015 - PRLog -- (MILWAUKEE, WI)- Two choruses, six professional soloists, and two orchestras will perform Johann Sebastian Bach’s St. Matthew Passion on March 22 at 3:00 PM at St. Dominic Catholic Parish in Brookfield. Considered by many to be one of the crowning achievements of Western Art and Culture, this piece is rarely performed due to the difficulty of the score and the large number of singers and musicians required. Bel Canto Chorus, along with Milwaukee Chamber Orchestra and Bel Canto Boy Choir, brings this epic rendition of St. Matthew’s account of the capture, trial, and crucifixion of Jesus Christ to the Milwaukee area for what may be a once in a lifetime opportunity for many patrons. “For me, this performance of Bach’s monumental St. Matthew Passion is an experience thirty years in the making,” said Music Director Richard Hynson. “I would not program the work until I felt mature enough to plumb its emotional and spiritual depths and to bring the drama to vivid, dramatic life. This is not simply a musical retelling of the passion and crucifixion of Jesus. It is a remarkably contemporary invitation to experience Bach’s profoundly beautiful music and is considered to be the pinnacle of his remarkable body of works. Because of its scope, the St. Matthew Passion receives few ‘live’ performances, so the opportunity to witness it is rare. Tickets ($29 - $37) are available online at www.belcanto.org or by phone at (414) 481-8801 (Monday – Friday, 9 AM to 5 PM). Senior, student, and group discounts are available. TICKETS: Tickets ($29 - $37) are available online at www.belcanto.org or by phone at (414) 481-8801 (Monday – Friday, 9 AM to 5 PM). Senior, student, and group discounts are available. This season marks Richard Hynson’s 27th year as Music Director of the Bel Canto Chorus. In addition, Hynson has served as Music Director of the Milwaukee Chamber Orchestra since 2006. In demand as a guest conductor, Hynson’s past engagements include performances with the Milwaukee Symphony, the Skylight Music Theatre, and the Racine, Sheboygan, and Waukesha Symphony Orchestras. Hynson has conducted at Carnegie Hall in New York City, where he led a large national festival chorus and orchestra in Ralph Vaughan Williams’ Dona Nobis Pacem. He has guest-conducted the Wisconsin Chamber Orchestra in one of the Concerts on the Square in Madison. He has also served as the Music Director for Gathering on the Green, the popular outdoor music festival in Mequon, WI. In 2012, Hynson was awarded the American Prize – community choral division. Hynson and members of Bel Canto Chorus have performed internationally at the acclaimed Spoleto Music Festival in Italy, the Festivals of Troyes and Rheims in France, the Llangollen Festival in Wales, and the Elora and Huntsville Festivals in Canada. In 2010, Bel Canto participated in Star Wars in Concert and in the Video Games Live national touring concert, and in February 2013, Bel Canto sang in the Distant Worlds touring concert. The chorus completed a successful international tour in July 2011, performing with several orchestras in Argentina and Uruguay, and in June 2013, Hynson conducted Bel Canto and two French choruses in three performances of Brahms’ Requiem with L’Ensemble Orchestral de Bordeaux in France. 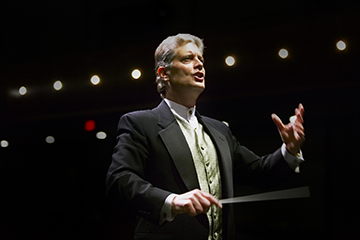 In addition to his work as a conductor and educator, Hynson is a composer. He has written a substantial body of published choral, vocal, and ensemble works, many of which he has recorded with Bel Canto Chorus singers. The U.S. Air Force Singing Sergeants have frequently performed Hynson’s “In the Midst of Life,” composed in response to the events of September 11. Founded in 1931, Bel Canto Chorus enriches the lives of its audiences and members through the presentation of fine choral music. The group has been led for more than 26 years by Richard Hynson, considered one of the nation's finest choral and orchestral conductors (American Prize Winner 2012). Bel Canto Chorus ranks in the top ten percent of choral organizations in the country in terms of budget, longevity, and repertoire. Educational outreach includes Bel Canto Senior Singers and Bel Canto Boy Choir. Rehearsals are held at the Milwaukee Youth Arts Center. Characterized by a heartfelt belief in the value of Bel Canto Chorus, and supported by its 100+ devoted singers, audiences, talented artistic and administrative staff, and dedicated board members, the group's passion for sharing the thrill of live, choral music has remained steadfast throughout its long, proud history. The only professional chamber orchestra in the greater Milwaukee area, Milwaukee Chamber Orchestra has been performing the highest quality chamber music for more than 30 years. Milwaukee Chamber Orchestra provides a unique experience for audience members as well as important performance opportunities to professional musicians in the area. For more information visit MilwaukeeChamberOrchestra.org. Bel Canto Boy Choir (BC)2 is the only all boy choir in the Southeast Wisconsin. Bel Canto offers the chance for boys who want to sing (grades 4-12) to learn music theory and techniques with other boys in their peer group. Participants put their skills into practice in performances with the Bel Canto adult singers and in concerts of their own. The group is distinctly non-judgmental and has as its main goal for the boys to enjoy their singing experience so that they will want to continue with music while they are young and as they grow to adulthood. For additional information, promotional photos, or interview requests, contact the Bel Canto office at (414) 481-8801.
: Bel Canto Chorus of Milwaukee, Inc.